An internal memo sent to employees of the U.S. Fish and Wildlife Service's Region 8 office touched off alarms throughout the waterfowl conservation community. The memo, sent in June, was written by assistant regional director of migratory birds and state programs, Eric Davis. "Effective now, we will stop working on anything that is not related to renewable energy or the permit backlog," Davis wrote. That means anything related to waterfowl and waterfowl habitat will essentially be ignored in California, southern Oregon and Nevada by the USFWS. Up to 11 staff members working on migratory birds will instead focus on renewable energy permits. A host of migratory bird-specific programs will be suspended, too. However, the change will not impact national wildlife refuges, many of which are open to waterfowl hunting. "This is worrisome to us," says Ducks Unlimited chief conservation officer Paul Schmidt. 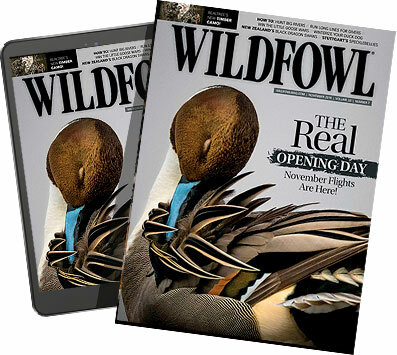 "California is in the middle of a major drought and it could have a significant impact on waterfowl. I'm not sure what the Fish and Wildlife Service can do about the drought, but the fact that they are suspending all other work related to migratory birds is certainly troubling." Marie Strassburger, chief of the division of migratory birds and habitat for Region 8, says the decision is only temporary and should not last beyond September. "We had to make some tough decisions," says Strassburger. "We have an incredible amount of renewable energy projects in California and Nevada that need our attention. We are also short two critical staff members, so the backlog of permits has grown considerably in recent months." Strassburger doesn't know exactly how many projects are in the works that require lengthy reviews, but she said it's in the dozens. The agency oversees environmental impact statements and other National Environmental Policy Act requirements for each project. Some can take three years to complete. That's one reason some permits have "languished for a year," Davis wrote in his memo. Additionally, the regional office handles as many as 3,000 other permits per year. Some take an hour, some a day, but they are a necessary and mandatory part of her agency's duties, says Strassburger, adding, "We are just trying to get to a spot where all the applications aren't piled up." Schmidt, a former USFWS staff member, understands the agency's dilemma. So does Delta Waterfowl vice president of U.S. policy John Devney. Budget cuts and demands related to non-game wildlife are placing undue burden on the USFWS. However, both men agree that waterfowl and other migratory birds should not take a back seat, not when the agency is legally obligated to manage them under the Migratory Bird Treaty Act. Despite the mandate, Region 8 staff members will stop working on anything that is not directly related to wind or solar energy projects. In the memo, Davis said the Region 8 office would stop: "&apos;¦flyway (work, calls, and meetings), MB (migratory bird) Centennial, MB database, MB Vision document, duck stamps and junior duck stamps&apos;¦non-game calls." Most troubling to Devney is the decision to halt all work on the Service's Joint Venture, a cooperative partnership between federal, state and local government agencies and non-government organizations that work toward the same goal. Groups like Delta, DU and the California Waterfowl Association collaborate with various government and private entities on projects that benefit wetlands and wildlife. The USFWS is, in many ways, the backbone of the Joint Venture. The decision to abandon Joint Venture work, even if temporarily, may have long-term implications. "If renewable energy permits are a priority for Fish and Wildlife and this administration, then it needs to be fully resourced. Don't take resources away from one part of their mission to work on another. Find the funds to hire staff specifically for renewables," says Devney. "I'm also bothered by the ease with which this decision was made." Despite promises the changes are temporary, Devney fears the renewable energy work will take longer than planned. The push for wind and solar energy by the Obama administration shows no signs of slowing down, particularly in the western states. The challenges the agency is facing now may only increase in the foreseeable future. "The federal government doesn't stay on schedule very often. I would not be surprised if the work they have to do will take longer than they thought, but I'm certainly willing to wait and see," adds Devney. "I can't imagine the renewable energy wave will be dealt with in four to six months." What's more troubling in the long-run, and Schmidt agrees, is the potential for what Devney calls "mission creep." As calls for more "green" energy increase, it's likely the USFWS will be faced with more work related to energy permits. Ducks, hunting regulations and waterfowl habitat may become little more than an afterthought since waterfowlers are such a small group. "Waterfowl issues are still important to us," Strassburger says. The Region 8 memo expresses a somewhat different view. Davis wrote, "&apos;¦prioritization is about saying yes to the most important work. Right now, we are not sufficiently focused on our highest priorities." That appears to be renewable energy. More troubling, Davis wrote, "We must always remember that the alternative is continued reliance on fossil fuels. Our focus will continue to be renewable energy." Even, he wrote, after his office gets caught up with the permit backlog. Leaders from Delta and DU sent letters expressing their disappointment and concern over the memo to USFWS director Dan Ashe and Interior secretary Sally Jewell. Both groups were waiting for a reply a month later. The good news is that so far, other USFWS regions have not been overwhelmed by a flood of renewable energy projects. California and Nevada have a high demand for energy, large populations and the raw resources necessary to generate renewable energy. California in particular is Ground Zero for green energy development. Wind, however, is abundant in other parts of the country. Wind farms are becoming an increasingly common sight on the prairie. Wind projects are also planned for the Great Lakes. "I can't help but wonder if the Fish and Wildlife Service is shifting away from game and migratory bird management. This latest decision certainly gives us pause," says Devney. "Hunters and everyone else who loves waterfowl need to stand up and voice their opinions about this."